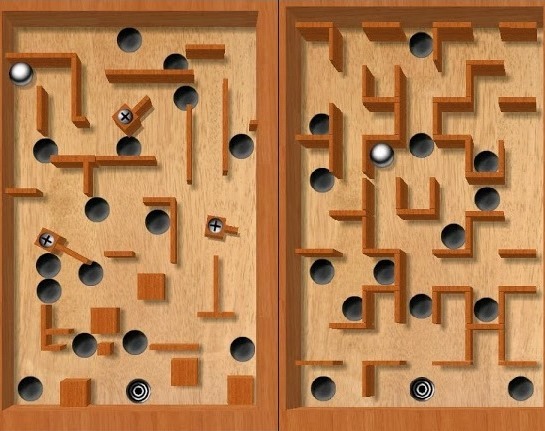 Labyrinth is a classic game where the gamer controls a fast moving steel ball by tilting the phone (wooden labyrinth on the screen). The game checks the ability of the gamer to control the ball while rolling past obstacles like walls and holes on the screen. The game has 258 levels and the gamer can create and share his own levels online. The basic game is available free but has ads. A premium ad free version of the game is available for US$ 3.99. Falling Ball is a simple game where the gamer has to just tilt the phone to the left or right to avoid dropping balls from hitting the 2D image on the screen. The game starts with a single ball falling down here and there. But, as the game progresses, the number of balls increases in the same limited space. This game is totally free. Radio Ball 3D is a accelerometer controlled tunnel game. The game features a rolling uranium ball which is driven by radioactive waste. The gamer has to take the ball as far as he can and collect power-ups, perform combos, and escape or destroy the obstacles which are encountered in the middle. Gamers can post their scores online and compete with other gamers using Score loop. The price of the game is US$ 2.06. Skies of Glory are a 3D accelerometer game which looks and feels very realistic and challenging. The game features lot of graphics and effects. The gamer has to control a flying plane while battling other planes, battle tanks, navy vessels, etc. This is basically a single player game. There is a chance to connect with other gamers online and convert it into a multi-player game. This game can be very addictive to gaming buffs. The price of this game is US$ 4.99. This game is based on the gamer flying a B2 stealth bomber by moving the phone around. The B2 stealth bomber has different kinds of weapons and the gamer can launch rockets and bombs with a single tap. Unlike other games, this game is designed for infinite play, so the gamers can keep on flying around forever. The price of this game is US$ 1. This is one of the most intense 3D racing games available for Android. The game is designed with stunning console-quality 3D graphics which greatly enrich the playtime experience. It has five single player modes and takes the gamer through vistas around the world like snow-capped mountains, the Great Wall, tropical beaches, etc. The price of this game is US$ 2. Claudia is a blogger by profession. She loves writing, reading and travelling. She contributes to Raul Gorrin Seguros La Vitalicia.